Steam engines have a long history, going back almost two thousand years. Early devices were not practical power producers, but more advanced designs became a major source of mechanical power during the industrial revolution. 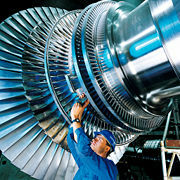 Modern steam turbines generate about half of the electric power in the world. Many steam engines are external combustion engines, although other sources of heat such as solar power, nuclear power or geothermal energy are often used. The heat cycle is known as the Rankine cycle. In general usage, the term "steam engine" can refer to integrated steam plants such as railway steam locomotives and portable engines, or may refer to the motor unit alone, as in the beam engine and stationary steam engine. Specialized devices such as steam hammers and steam pile drivers are dependent on steam supplied from a separate, often remotely-located boiler. 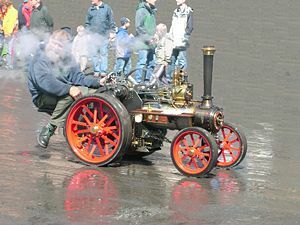 Steam engines have been classified as external combustion engines. In an external combustion engine, heat is supplied to the working fluid of the power cycle by an external source. The external combustion engine allows the burning of virtually any fuel as the heat source for the engine. This explains the success of this engine, because less expensive and/or more renewable or sustainable fuel or heat sources can be used, because the working fluid remains separated from the fuel, and therefore cleaner, which results in less maintenance and longer engine life. This is contrasted to the generally more familiar form of heat engine (known as an internal combustion engine) in which the working fluid of the power cycle is the gaseous products of the combustion process, and the heat is added to the cycle by combustion of fuel internal to the machine. Typical gasoline/petrol and diesel engines are internal combustion engines. Since the early eighteenth century steam power has been set to a variety of practical uses. At first it was applied to reciprocating pumps, but from the 1780s rotative engines (that is, those converting reciprocating motion into rotary motion) began to appear, driving factory machinery. At the turn of the nineteenth century, steam-powered transport on both sea and land began to make its appearance becoming ever more predominant as the century progressed. Steam engines can be said to have been the moving force behind the Industrial Revolution and saw widespread commercial use driving machinery in factories and mills, powering pumping stations and transport appliances such as railway locomotives, ships and road vehicles. Their use in agriculture led to an increase in the land available for cultivation. Very low power engines are used to power models and specialty applications such as the steam clock. The presence of several phases between heat source and power delivery has meant that it has always been difficult to obtain a power-to-weight ratio anywhere near that obtainable from internal combustion engines; notably this has made steam aircraft extremely rare. Similar considerations have meant that for small and medium-scale applications steam has been largely superseded by internal combustion engines or electric motors, which has given the steam engine an out-dated image. However, it is important to remember that the power supplied to the electric grid is predominantly generated using steam turbine plant, so that indirectly the world's industry is still dependent on steam power. Recent concerns about fuel sources and pollution have incited a renewed interest in steam both as a component of cogeneration processes and as a prime mover. This is becoming known as the Advanced Steam movement. Steam engines can be classified by their application. Winding engines, rolling mill engines, steam donkeys, marine engines, and similar applications which need to frequently stop and reverse. Engines providing power, which rarely stop and do not need to reverse. These include engines used in thermal power stations and those that were used in pumping stations, mills, factories and to power cable railways and cable tramways before the widespread use of electric power. The steam donkey is technically a stationary engine but is mounted on skids to be semi-portable. It is designed for logging use and can drag itself to a new location. Having secured the winch cable to a sturdy tree at the desired destination, the machine will move towards the anchor point as the cable is winched in. A portable engine is a stationary engine mounted on wheels so that it may be towed to a work-site by horses or a traction engine, rather than being fixed in a single location. In many mobile applications internal combustion engines are more frequently used due to their higher power-to-weight ratio, steam engines are used when higher efficiency is needed and weight is less of an issue. The history of the steam engine stretches back as far as the first century AD; the first recorded rudimentary steam engine being the aeolipile described by Hero of Alexandria. In the following centuries, the few engines known about were essentially experimental devices used by inventors to demonstrate the properties of steam, such as the rudimentary steam turbine device described by Taqi al-Din in 1551, and Giovanni Branca in 1629. The first practical steam-powered "engine" was a water pump, developed in 1698 by Thomas Savery. It proved only to have a limited lift height and was prone to boiler explosions, but it still received some use in mines and pumping stations. The first commercially-successful engine did not appear until 1712. Incorporating technologies discovered by Savery and Denis Papin, the atmospheric engine, invented by Thomas Newcomen, paved the way for the Industrial Revolution. Newcomen's engine was relatively inefficient, and in most cases was only used for pumping water. It was mainly employed for draining mine workings at depths up until then impossible, but also for providing a reusable water supply for driving waterwheels at factories sited away from a suitable "head." The next major step occurred when James Watt developed an improved version of Newcomen's engine. Watt's engine used 75 percent less coal than Newcomen's, and was hence much cheaper to run. Watt proceeded to develop his engine further, modifying it to provide a rotary motion suitable for driving factory machinery. This enabled factories to be sited away from rivers, and further accelerated the pace of the Industrial Revolution. Around 1800, Richard Trevithick introduced engines using high-pressure steam. These were much more powerful than previous engines and could be made small enough for transport applications. Thereafter, technological developments and improvements in manufacturing techniques (partly brought about by the adoption of the steam engine as a power source) resulted in the design of more efficient engines that could be smaller, faster, or more powerful, depending on the intended application. Steam engines remained the dominant source of power well into the twentieth century, when advances in the design of electric motors and internal combustion engines gradually resulted in the vast majority of reciprocating steam engines being replaced in commercial usage, and the ascendancy of steam turbines in power generation. The heat is transferred to the water in a pressurized boiler, ultimately boiling the water and transforming it into saturated steam. Steam in its saturated state is always produced at the temperature of the boiling water, which in turn depends on the steam pressure on the water surface within the boiler. There are two fundamental components of a steam engine: the boiler or steam generator, and the motor unit, itself often referred to as a "steam engine." The two components can either be integrated into a single unit or can be placed at a distance from each other, in a variety of configurations. Other components are often present; pumps (such as an injector) to supply water to the boiler during operation, condensers to recirculate the water and recover the latent heat of vaporization, and superheaters to raise the temperature of the steam above its saturated vapor point, and various mechanisms to increase the draft for fireboxes. When coal is used, a chain or screw stoking mechanism and its drive engine or motor may be included to move the fuel from a supply bin (bunker) to the firebox. The heat required for boiling the water and supplying the steam can be derived from various sources, most commonly from burning combustible materials with an appropriate supply of air in a closed space (called variously combustion chamber, firebox). In some cases the heat source is a nuclear reactor or geothermal energy. As with all heat engines, a considerable quantity of waste heat is produced at relatively low temperature. This must be disposed of. The simplest cold sink is simply to vent the steam to the environment. This is often used on Steam locomotives, but is quite inefficient. Steam locomotive condensing apparatus can be employed to improve efficiency. Steam turbines in power stations often use cooling towers which are essentially one form of condenser. Sometimes the "waste heat" is useful in and of itself, and in those cases very high overall efficiency can be obtained; for example combined heat and power uses the waste heat for district heating. Boilers are pressure vessels that contain water to be boiled, and some kind of mechanism for transferring the heat to the water so as to boil it. Once turned to steam, some boilers use superheating to raise the temperature of the steam further. This allows for greater efficiency. A motor unit takes a supply of steam at high pressure and temperature and gives out a supply of steam at lower pressure and temperature, using as much of the difference in steam energy as possible to do mechanical work. A motor unit is often called "steam engine" in its own right. They will also operate on compressed air or other gas. This means that a charge of steam works only once in the cylinder. It is then exhausted directly into the atmosphere or into a condenser, but remaining heat can be recuperated if needed to heat a living space, or to provide warm feedwater for the boiler. In most reciprocating piston engines the steam reverses its direction of flow at each stroke (counterflow), entering and exhausting from the cylinder by the same port. The complete engine cycle occupies one rotation of the crank and two piston strokes; the cycle also comprises four events—admission, expansion, exhaust, compression. These events are controlled by valves often working inside a steam chest adjacent to the cylinder; the valves distribute the steam by opening and closing steam ports communicating with the cylinder end(s) and are driven by valve gear, of which there are many types. The simplest valve gears give events of fixed length during the engine cycle and often make the engine rotate in only one direction. Most however have a reversing mechanism which additionally can provide means for saving steam as speed and momentum are gained by gradually "shortening the cutoff" or rather, shortening the admission event; this in turn proportionately lengthens the expansion period. However, as one and the same valve usually controls both steam flows, a short cutoff at admission adversely affects the exhaust and compression periods which should ideally always be kept fairly constant; if the exhaust event is too brief, the totality of the exhaust steam cannot evacuate the cylinder, choking it and giving excessive compression ("kick back"). In the 1840s and 50s, there were attempts to overcome this problem by means of various patent valve gears with separate variable cutoff valves riding on the back of the main slide valve; the latter usually had fixed or limited cutoff. The combined setup gave a fair approximation of the ideal events, at the expense of increased friction and wear, and the mechanism tended to be complicated. The usual compromise solution has been to provide lap by lengthening rubbing surfaces of the valve in such a way as to overlap the port on the admission side, with the effect that the exhaust side remains open for a longer period after cut-off on the admission side has occurred. This expedient has since been generally considered satisfactory for most purposes and makes possible the use of the simpler Stephenson, Joy, and Walschaerts motions. Corliss, and later, poppet valve gears had separate admission and exhaust valves driven by trip mechanisms or cams profiled so as to give ideal events; most of these gears never succeeded outside of the stationary marketplace due to various other issues including leakage and more delicate mechanisms. Before the exhaust phase is quite complete, the exhaust side of the valve closes, shutting a portion of the exhaust steam inside the cylinder. This determines the compression phase where a cushion of steam is formed against which the piston does work whilst its velocity is rapidly decreasing; it moreover obviates the pressure and temperature shock, which would otherwise be caused by the sudden admission of the high pressure steam at the beginning of the following cycle. 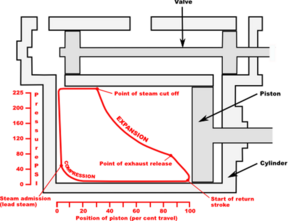 As steam expands in a high pressure engine its temperature drops; because no heat is released from the system, this is known as adiabatic expansion and results in steam entering the cylinder at high temperature and leaving at low temperature. This causes a cycle of heating and cooling of the cylinder with every stroke which is a source of inefficiency. A method to lessen the magnitude of this heating and cooling was invented in 1804 by British engineer Arthur Woolf, who patented his Woolf high pressure compound engine in 1805. In the compound engine, high pressure steam from the boiler expands in a high pressure (HP) cylinder and then enters one or more subsequent lower pressure (LP) cylinders. The complete expansion of the steam now occurs across multiple cylinders and as less expansion now occurs in each cylinder so less heat is lost by the steam in each. This reduces the magnitude of cylinder heating and cooling, increasing the efficiency of the engine. To derive equal work from lower pressure steam requires a larger cylinder volume as this steam occupies a greater volume. Therefore, the bore, and often the stroke, are increased in low pressure cylinders resulting in larger cylinders. Double expansion (usually known as compound) engines expanded the steam in two stages. The pairs may be duplicated or the work of the large LP cylinder can be split with one HP cylinder exhausting into one or the other, giving a 3-cylinder layout where cylinder and piston diameter are about the same making the reciprocating masses easier to balance. With two-cylinder compounds used in railway work, the pistons are connected to the cranks as with a two-cylinder simple at 90° out of phase with each other (quartered). When the double expansion group is duplicated, producing a 4-cylinder compound, the individual pistons within the group are usually balanced at 180°, the groups being set at 90° to each other. In one case (the first type of Vauclain compound), the pistons worked in the same phase driving a common crosshead and crank, again set at 90° as for a two-cylinder engine. With the 3-cylinder compound arrangement, the LP cranks were either set at 90° with the HP one at 135° to the other two, or in some cases all three cranks were set at 120°. The adoption of compounding was common for industrial units, for road engines and almost universal for marine engines after 1880; it was not universally popular in railway locomotives where it was often perceived as complicated. This is partly due to the harsh railway operating environment and limited space afforded by the loading gauge (particularly in Britain, where compounding was never common and not employed after 1930). However although never in the majority it was popular in many other countries. An animation of a simplified triple-expansion engine. High-pressure steam (red) enters from the boiler and passes through the engine, exhausting as low-pressure steam (blue) to the condenser. 1890s-vintage triple-expansion marine engine that powered the SS Christopher Columbus. It is a logical extension of the compound engine (described above) to split the expansion into yet more stages to increase efficiency. The result is the multiple expansion engine. Such engines use either three or four expansion stages and are known as triple and quadruple expansion engines respectively. These engines use a series of double-acting cylinders of progressively increasing diameter and/or stroke and hence volume. These cylinders are designed to divide the work into three or four, as appropriate, equal portions for each expansion stage. As with the double expansion engine, where space is at a premium, two smaller cylinders of a large sum volume may be used for the low pressure stage. Multiple expansion engines typically had the cylinders arranged inline, but various other formations were used. In the late nineteenth century, the Yarrow-Schlick-Tweedy balancing 'system' was used on some marine triple expansion engines. Y-S-T engines divided the low pressure expansion stages between two cylinders, one at each end of the engine. This allowed the crankshaft to be better balanced, resulting in a smoother, faster-responding engine which ran with less vibration. This made the 4-cylinder triple-expansion engine popular with large passenger liners (such as the Olympic class), but was ultimately replaced by the virtually vibration-free turbine (see below). The image to the right shows an animation of a triple expansion engine. The steam travels through the engine from left to right. The valve chest for each of the cylinders is to the left of the corresponding cylinder. The development of this type of engine was important for its use in steamships as by exhausting to a condenser the water can be reclaimed to feed the boiler, which is unable to use seawater. Land-based steam engines could exhaust much of their steam, as feed water was usually readily available. Prior to and during World War II, the expansion engine dominated marine applications where high vessel speed was not essential. It was, however, superseded by the British invented steam turbine where speed was required, for instance in warships, such as the pre-dreadnought battleships, and ocean liners. HMS Dreadnought of 1905 was the first major warship to replace the proven technology of the reciprocating engine with the then-novel steam turbine. The poppet valves are controlled by the rotating camshaft at the top. High pressure steam enters, red, and exhausts, yellow. 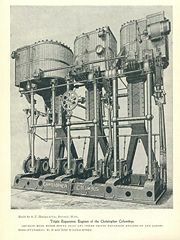 This is intended to remedy the difficulties arising from the usual counterflow cycle mentioned above which means that at each stroke the port and the cylinder walls will be cooled by the passing exhaust steam, whilst the hotter incoming admission steam will waste some of its energy in restoring working temperature. The aim of the uniflow is to remedy this defect by providing an additional port uncovered by the piston at the end of its half-stroke making the steam flow only in one direction. By this means, thermal efficiency is improved by having a steady temperature gradient along the cylinder bore. The simple-expansion uniflow engine is reported to give efficiency equivalent to that of classic compound systems with the added advantage of superior part-load performance. It is also readily adaptable to high-speed uses and was a common way to drive electricity generators towards the end of the nineteenth century, before the coming of the steam turbine. The inlet valves may be driven by a double cam system whose phasing and duration is controllable; this allows adjustments for high torque and power when needed with more restrained use of steam and greater expansion for economical cruising. Uniflow engines have been produced in single-acting, double-acting, simple, and compound versions. Skinner 4-crank 8-cylinder single-acting tandem compound engines power two Great Lakes ships still trading today (2007). These are the Saint Mary’s Challenger, that in 2005 completed 100 years of continuous operation as a powered carrier (the Skinner engine was fitted in 1950) and the car ferry, SS Badger. In the early 1950s, the Ultimax engine, a 2-crank 4-cylinder arrangement similar to Skinner’s, was developed by Abner Doble for the Paxton car project with tandem opposed single-acting cylinders giving effective double-action. A rotor of a modern steam turbine, used in a power plant. A steam turbine consists of an alternating series of one or more rotating discs mounted on a drive shaft, rotors, and static discs fixed to the turbine casing, stators. The rotors have a propeller-like arrangement of blades at the outer edge. Steam acts upon these blades, producing rotary motion. The stator consists of a similar, but fixed, series of blades that serve to redirect the steam flow onto the next rotor stage. A steam turbine often exhausts into a surface condenser that provides a vacuum. The stages of a steam turbine are typically arranged to extract the maximum potential work from a specific velocity and pressure of steam, giving rise to a series of variably sized high and low pressure stages. Turbines are only effective if they rotate at very high speed, therefore they are usually connected to reduction gearing to drive another mechanism, such as a ship's propeller, at a lower speed. This gearbox can be mechanical but today it is more common to use an alternator/generator set to produce electricity that later is used to drive an electric motor. A turbine rotor is also capable of providing power when rotating in one direction only. Therefore, a reversing stage or gearbox is usually required where power is required in the opposite direction. The main use for steam turbines is in electricity generation (about 80 percent of the world's electric production is by use of steam turbines) and to a lesser extent as marine prime movers. In the former, the high speed of rotation is an advantage, and in both cases the relative bulk is not a disadvantage; in the latter (pioneered on the Turbinia), the light weight, high efficiency and high power are highly desirable. Virtually all nuclear power plants and some nuclear submarines, generate electricity by heating water to provide steam that drives a turbine connected to an electrical generator for main propulsion. A limited number of steam turbine railroad locomotives were manufactured. Some non-condensing direct-drive locomotives did meet with some success for long haul freight operations in Sweden, but were not repeated. Elsewhere, notably in the U.S., more advanced designs with electric transmission were built experimentally, but not reproduced. It was found that steam turbines were not ideally suited to the railroad environment and these locomotives failed to oust the classic reciprocating steam unit in the way that modern diesel and electric traction has done. It is possible to use a mechanism based on a pistonless rotary engine such as the Wankel engine in place of the cylinders and valve gear of a conventional reciprocating steam engine. Many such engines have been designed, from the time of James Watt to the present day, but relatively few were actually built and even fewer went into quantity production; see link at bottom of article for more details. The major problem is the difficulty of sealing the rotors to make them steam-tight in the face of wear and thermal expansion; the resulting leakage made them very inefficient. Lack of expansive working, or any means of control of the cutoff is also a serious problem with many such designs. By the 1840s, it was clear that the concept had inherent problems and rotary engines were treated with some derision in the technical press. However, the arrival of electricity on the scene, and the obvious advantages of driving a dynamo directly from a high-speed engine, led to something of a revival in interest in the 1880s and 1890s, and a few designs had some limited success. Invented by Australian engineer Alan Burns and developed in Britain by engineers at Pursuit Dynamics, this underwater jet engine uses high pressure steam to draw in water through an intake at the front and expel it at high speed through the rear. When steam condenses in water, a shock wave is created and is focused by the chamber to blast water out of the back. To improve the engine's efficiency, the engine draws in air through a vent ahead of the steam jet, which creates air bubbles and changes the way the steam mixes with the water. Unlike in conventional steam engines, there are no moving parts to wear out, and the exhaust water is only several degrees warmer in tests. The engine can also serve as pump and mixer. This type of system is referred to as "PDX Technology" by Pursuit Dynamics. In more modern times there has been limited use of steam for rocketry—particularly for rocket cars. The technique is simple in concept, simply fill a pressure vessel with hot water at high pressure, and open a valve leading to a suitable nozzle. The drop in pressure immediately boils some of the water and the steam leaves through a nozzle, giving a significant propulsive force. It might be expected that water in the pressure vessel should be at high pressure; but in practice the pressure vessel has considerable mass, which reduces the acceleration of the vehicle. Therefore, a much lower pressure is used, which permits a lighter pressure vessel, which in turn gives the highest final speed. There are even speculative plans for interplanetary use. Although steam rockets are relatively inefficient in their use of propellant, this very well may not matter as the solar system is believed to have extremely large stores of water ice which can be used as propellant. Extracting this water and using it in interplanetary rockets requires several orders of magnitude less equipment than breaking it down to hydrogen and oxygen for conventional rocketry. For safety reasons nearly all steam engines are equipped with mechanisms to monitor the boiler, such as a pressure gauge and a sight glass to monitor the water level. The strength of the steam engine for modern purposes is in its ability to convert heat from almost any source into mechanical work, unlike the internal combustion engine. Similar advantages are found in a different type of external combustion engine, the Stirling engine, which can offer efficient power (with advanced regenerators and large radiators) at the cost of a much lower power-to-size/weight ratio than even modern steam engines with compact boilers. These Stirling engines are not commercially produced, although the concepts are promising. Steam locomotives are especially advantageous at high elevations as they are not adversely affected by the lower atmospheric pressure. This was inadvertently discovered when steam locomotives operated at high altitudes in the mountains of South America were replaced by diesel-electric units of equivalent sea level power. These were quickly replaced by much more powerful locomotives capable of producing sufficient power at high altitude. For road vehicles, steam propulsion has the advantage of having high torque from stationary, removing the need for a clutch and transmission, though start-up time and sufficiently compact packaging remain a problem. In Switzerland (Brienz Rothhorn) and Austria (Schafberg Bahn) new rack steam locomotives have proved very successful. They were designed based on a 1930s design of Swiss Locomotive and Machine Works (SLM) but with all of today's possible improvements like roller bearings, heat insulation, light-oil firing, improved inner streamlining, one-man-driving and so on. These resulted in 60 percent lower fuel consumption per passenger and massively reduced costs for maintenance and handling. Economics now are similar or better than with most advanced diesel or electric systems. Also a steam train with similar speed and capacity is 50 percent lighter than an electric or diesel train, thus, especially on rack railways, significantly reducing wear and tear on the track. Also, a new steam engine for a paddle steam ship on Lake Geneva, the Montreux, was designed and built, being the world's first full-size ship steam engine with an electronic remote control. The steam group of SLM in 2000 created a wholly owned company called DLM to design modern steam engines and steam locomotives. Steam engines possess boilers and other components that are pressure vessels that contain a great deal of potential energy. Steam explosions can and have caused great loss of life in the past. While variations in standards may exist in different countries, stringent legal, testing, training, care with manufacture, operation and certification is applied to try to minimize or prevent such occurrences. Steam engines frequently possess two independent mechanisms for ensuring that the pressure in the boiler does not go too high; one may be adjusted by the user, the second is typically designed as an ultimate fail-safe. Lead plugs may be present so that if the water level drops, the lead melts and the steam escapes, depressurizing the boiler. This prevents the boiler overheating to the point of catastrophic structural failure. The efficiency of an engine can be calculated by dividing the energy output of mechanical work that the engine produces by the energy input to the engine by the burning fuel. In practice, a steam engine exhausting the steam to atmosphere will typically have an efficiency (including the boiler) in the range of 1 percent to 10 percent, but with the addition of a condenser and multiple expansion, it may be greatly improved to 25 percent or better. A power station with steam reheat, economizer etc. will achieve about 20-40 percent thermal efficiency. It is also possible to capture the waste heat using cogeneration in which the waste heat is used for heating. By this means it is possible to use as much as 85-90% of the input energy. Although the reciprocating steam engine is no longer in widespread commercial use, various companies are exploring or exploiting the potential of the engine as an alternative to internal combustion engines. The company Energiprojekt AB in Sweden has made progress in using modern materials for harnessing the power of steam. The efficiency of Energiprojekt's steam engine reaches some 27-30% on high-pressure engines. It is a single-step, 5-cylinder engine (no compound) with superheated steam and consumes approx. 4 kg of steam per kWh. Harold Holcroft in his 7859 25 patent dated November 1909: Improvements in or relating to valve gears for engines worked by fluid pressure [Holcroft steamindex], as does Arturo Caprotti:170,877 Improvements in valve gears for elastic-fluid engines. Published: November 4, 1921. Application number: 12341/1920. Applied: May 4, 1920; 13261/1907. Improvements in steam turbines and other multiple expansion elastic fluid prime movers. Applied June 7, 1907 (in Italy June 7, 1906). Published August 7, 1908. ↑ Encyclopedia Britannica, Steam engine. Retrieved October 7, 2008. ↑ American Heritage Dictionary of the English Language, 4th ed. (Boston, MA: Houghton Mifflin Company, 2000, ISBN 9780618082308). ↑ Ahmad Y. Hassan, Taqi al-Din and Arabic Mechanical Engineering (Aleppo, SY: Institute for the History of Arabic Science, University of Aleppo, 1976), 34-35. ↑ University of Rochester, The growth of the steam engine, chapter one. Retrieved October 7, 2008. ↑ 5.0 5.1 John van Riemsdijk, Compound Locomotives (Penryn, UK: Atlantic Transport, 1994, ISBN 0906899613), 2-3. ↑ George W. Carpenter, La locomotive à vapeur (Bath, UK: Camden Miniature Steam Services, 2000, ISBN 0953652300), 56-72. ↑ A.M. Bell, Locomotives (London, UK: Virtue and Company, 1950), 61-63. ↑ Car Ferries, Skinner Engines. Retrieved October 7, 2008. ↑ George Wharton, Great Lakes Fleet Page Vessel Feature—St. Mary’s Challenger, Boatnerd.com. Retrieved October 7, 2008. ↑ Max Hanley, Great Lakes Fleet Page Vessel Feature—Badger, Boatnerd.com. Retrieved October 7, 2008. ↑ Online Archive of California, Paxton Engineering Division Report (2 of 3). Retrieved October 7, 2008. ↑ Near Earth Object Fuel, Home Page. Retrieved October 7, 2008. ↑ Roger Waller, Modern steam—An economic and environmental alternative to diesel traction. Retrieved October 7, 2008. ↑ Energi Projekt, How heat and electricity is created in our concept. Retrieved October 7, 2008. Bray, Stan. 2005. Making Simple Model Steam Engines. Ramsbury, UK: Crowood. ISBN 1861267738. Carpenter, George W., and Contributors. 2000. La locomotive à vapeur. Bath, UK: Camden Miniature Steam Services. ISBN 0953652300. Riemsdijk, John van. 1994. Compound Locomotives. Penryn, UK: Atlantic Transport. ISBN 0906899613. All links retrieved October 21, 2015. Titanic's Triple Expansion Engines on Titanic-Titanic.com. Howstuffworks - "How Steam Engines Work". This page was last modified on 21 October 2015, at 15:46.